I'm sure you caught my Fall Book Haul photo on instagram! I have been purchasing away - discount shopping, of course! Most of my gently used books are between $2 and $5! One of these gems is "Let it Fall" by Maryann Cocca-Leffler. It was delivered to me after I accidentally bought TWO for $4! Oops...mom got one too though! So it all worked out! my kiddos - and you of course! I'm starting to introduce fiction vs. nonfiction, so I'm using Discovery Education's video "The Four Seasons" (chapter 4 for fall) as my nonfiction video. We're going to graph our attributes for fall, and organize our ideas about fiction vs nonfiction in a chart. 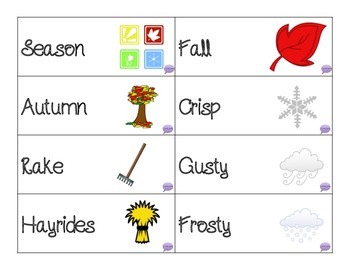 We're going to also be decorating leaves and doing peer reviews using attributes to describe our neighbors work! You can find this packet HERE on TpT! Hope you're falling in love with fall!